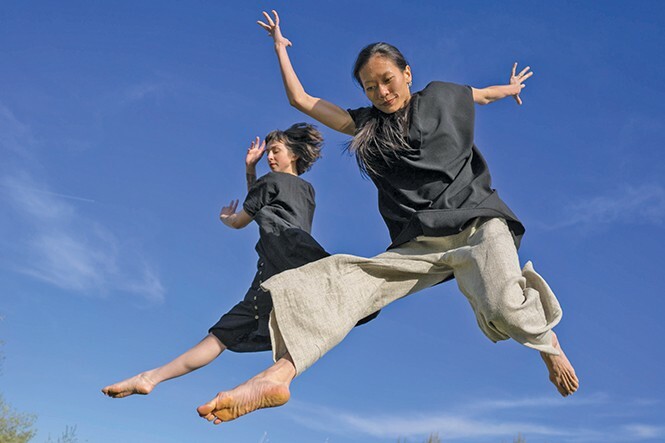 Those With Wings interprets a unique memoir through movement. The process of creating art almost always begins with blankness: a clean canvas, a bare stage, a blinking cursor on an empty screen. But when an artist begins the process of adapting an already-existing work to a new medium, you'd expect there to be more of a starting point for filling in that blankness. Perhaps that's why Terry Tempest Williams' When Women Were Birds makes for such intriguing source material for loveDANCEmore's new production Those With Wings—since the fascinating core of the work is the mystery of its own blank pages. Williams' 2012 memoir When Women Were Birds revolves around the author learning that her terminally ill mother has several volumes of journals—journals Williams never previously knew existed, and which her mother makes her promise not to read until after she dies. When Williams finally opens them, she finds that each one is blank. The book becomes a journey of attempting to understand what story Williams' mother was telling through those empty pages, and how that absence of any written words might have been connected to her role as a woman, a Mormon, a mother. Liz Izkovich—one of the three co-directors of Those With Wings, along with Ashley Anderson and Alysia Ramos—initially discovered the book, and brought it to her collaborators for all of them to read. Thier conversations led them to wonder how they might interpret When Women Were Birds as a movement piece—how they could take, according to Izkovich, "ideas that were speaking to all of us ... and imagine that in the context of our own art-making." The adaptation was less of a leap of faith than it might seem at first glance. "What's really interesting about the book is, it's also a visual piece of art," Izkovich says. "When she talks about her mother passing, and finds [the blank journals], at that point, all the pages in the book are blank. In the hard copy, there's also a bird that starts to fly across the pages. So there's this visual element of it as well." Though Izkovich, Anderson and Ramos initially reached out to Williams regarding their plans, the author ultimately was not directly involved in the process of creating Those With Wings. She did, however, give the project her blessing, according to Izkovich, "and encouraged us to take any and all creative liberties with it. ... It's a very non-literal adaptation, but we still capture the essence of what we took from the book, using snippets from the text and re-imagining it through the body." Those With Wings also serves as the culmination of a three-production Summer Series created by loveDANCEmore in collaboration with Seven Canyons Trust, celebrating the Jordan River. The venue for the performance is the Bend in the River Park on the Jordan River Trail, providing a unique outdoor component—and an ideal one for adapting a work by an author as closely identified with Utah's natural beauty as Williams. "It's such a complicated space," Izkovich says of the venue, "used by so many different kinds of people. And there are beavers, and birds, this really amazing cross-section of wildness and urban life. There are these built elements that are a little bit falling apart at this point, then efforts to restore native plants. And I always love that about Terry's work: Combining wildness and social life together, not as separate." The performance is also unique in using the intimate space for an interactive performance where audience size will be limited to 25 for each of the six scheduled performances. According to Izkovich, audience members will have opportunities to make choices regarding what they want to see and experience, and the performers will interact with them along the way. The lack of conventional seating also means people requiring ability accommodations should contact the company through its website. "This is part of all of our own creative journey. What is the kind of work we wanted to see?" Izkovich says. "It's where we could have that intimate experience with the audience, where you could be connecting. The smaller the audience, the more we feel we can offer people that intimate experience." Key to that experience, however, is capturing the emotions inspired by Williams' book as it explores what it means to have a voice, and to try to understand the inner life of a loved one. "It's thinking about silence and emptiness," Izkovich says of When Women Were Birds, "what's public and what's private. Dance is about relationships, about how you create that energy between audience and performers, and between the performers and the space, so that there's some kind of emotional resonance. ... This is the human story of us, as women, and what happens to our voices."